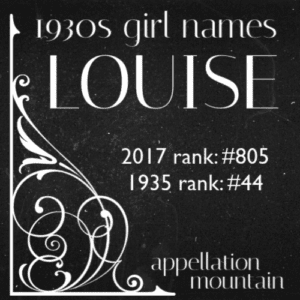 If the 100-year rule holds true, then 1930s girl names should be on the upswing right about now. It’s been a solid nine decades since most of those names were last in fashion – plenty of time for them to fall out of favor, hibernate, and feel fresh and interesting once more. 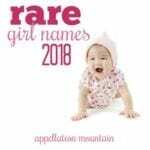 The first part of this list looked at the classic names that never really fall out of favor, as well as the 1930s girl names that are already back, in a big way. 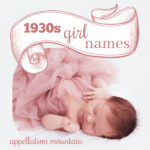 Now it’s time for some fun: the 1930s girl names on the upswing! These are the names that are gaining in use, but haven’t quite reached the same heights they enjoyed way back then. Don’t forget to check out the first half of the list here. And now, on to the comeback kids! Thanks to Broadway, Annie shines with sunny optimism, a cheerful name that fits right in with Sadie and her sisters. It’s got gumption, too, a name for a pioneer or a celebrated sharpshooter. 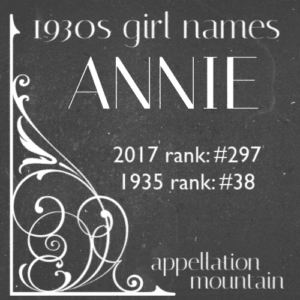 You might be better off to choose Anne, Anna, or any of the many longer Ann- names for your daughter’s birth certificate, but history tells us that just Annie has made it to the Top 100 plenty of times before. I’ve yet to write about Annie, but check back and I’ll update when I do. Not so long ago, Bonnie felt decidedly out-of-favor. But it’s doubled in use over the last decade, bringing the Scottish word name back into favor. It literally means pretty, from the French word bon – good. 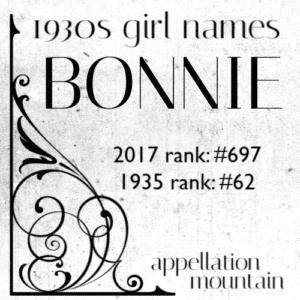 With Sadie in the Top 100, Bonnie might be prime for revival. Read more about Bonnie here. Dorothy takes us over the rainbow, a storybook hero name, complete with the ruby slippers to prove it. 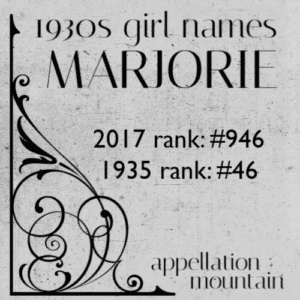 It’s among the hottest of the 1930s girl names. 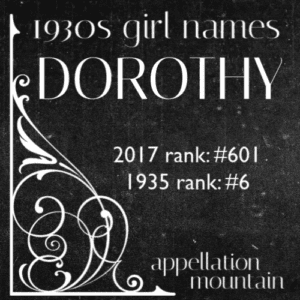 Dorothy bounded up over 300 places in just five years. We love a good three-syllable, ends-in-y choice. Dorothy is both heir to Avery and Emily, and their ancestor, too. Read more about Dorothy here. An Anglo-Saxon favorite revived in the nineteenth century, literary and historic Edith might be ready for another day in the sun. The name benefits from Lady Edith of Downton Abbey fame, as well as sweet built-in nickname Edie. 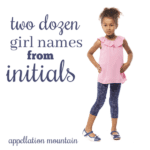 It’s a strong name for a woman, but nicely wearable for a child, too. Read more about Edith here. 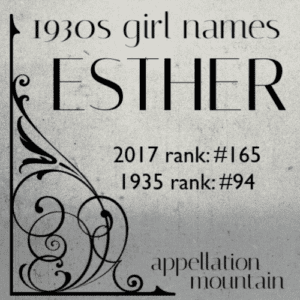 Once a fashionable favorite, Esther had started slipping by the 1930s. But the name never fell that far. In 1944, Judy Garland played Esther in hit musical Meet Me in St. Louis. Esther today reminds me of Abigail circa 1978 or so – a rising traditional favorite. Big in the UK, Florence lingered in obscurity until very recently in the US. It’s one of the names that re-entered the US Top 1000 with the May 2018 data release. Classic and refined, shared with a legendary city, with plenty of notable namesakes and nicknames galore, Florence feels like a logical revival choice. Read more about Florence here. Lady-like Frances lagged behind energetic, Italian Francesca for a while. But now, it’s the short, sweet, and slightly more classic Frances on the rise. It’s a sister name for Alice, an alternative to Eleanor. Nicknames range from boyish Frankie to retro Frannie, both used by high profile parents in recent years. Read more about Frances here. Romantic, elaborate, and oh so very French, Josephine continues to rise. Maybe it’s all of the nicknames, from Josie to less-expected options. Or maybe it’s the name in full, spunky and sophisticated at the same time. Josephine Baker became a star in the era – and then a World War II spy, tying it to the era. 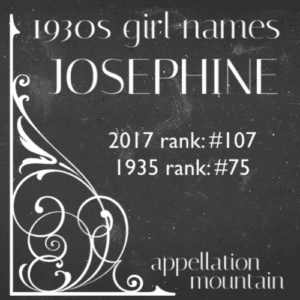 Read more about Josephine here. Judy is a Jetson, but Judith is an Old Testament heroine, capable and rather fierce. Like Charlie and Alex, Jude might be a possible unisex nickname. 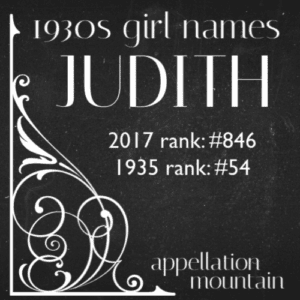 If you love strong, traditional girl names in the key of Eleanor and Katherine, but want something less expected, Judith could be exactly what you seek. Read more about Judith here. Sweet and summery, June belongs with so many ecovintage names in favor today, from Lily to Hazel. It’s as compact as classic Jane, but somehow less expected. 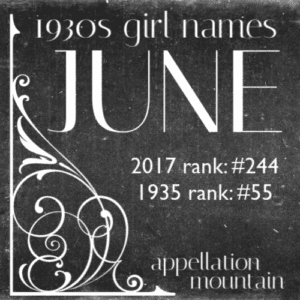 Longer June names, like Juniper, are rising in use, too, but it’s June that belongs with the 1930s girl names. After years in style limbo, Louise is back. And why not? Lucy and Luna are Top 100 favorites. It shortens to Lulu, Lou, and Lula, but requires no nickname. Louise Brooks remains a style icon, and it sounds serious enough for a chemist or a Congresswoman, too. Lucia became Lucilla, and then, in French, Lucille. It all goes back to the Latin lux, light. Legendary comic Lucille Ball lends it plenty of spirit. After many years in limbo, Lucille returned to the US Top 1000 in 2003. Lucy remains far more common. That’s been the case for over 120 years. 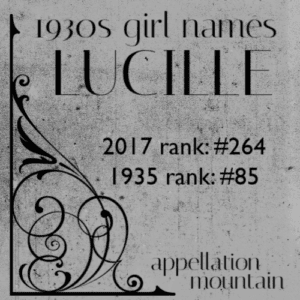 I’ve yet to write about Lucille, but check back and I’ll update when I do. Medieval English added a -y to everything: Cecilia became Cecily, Maria became Mary, and Margaret became Margery. Then it was re-spelled to resemble marjoram, the herb. 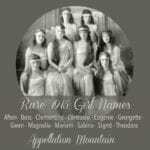 Marjoram was long considered a symbol of happiness, from the ancient world into the Victorian era. Read more about Marjorie here. 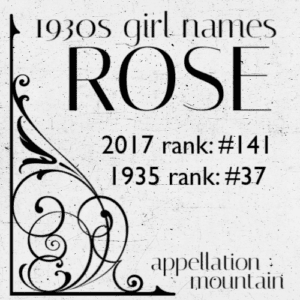 Spare and elegant, Rose has become the go-to middle name for a generation. But it really deserves a promotion to the first spot, which it occupied in big numbers way back in the 1930s. 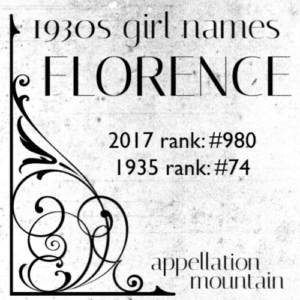 It’s climbing once more, a feminine, restrained name at home in the modern world. Longer Rose names abound, but this is the classic. I’ve yet to write about Rose, but check back and I’ll update when I do. 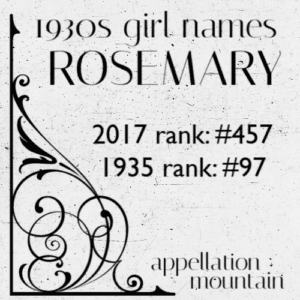 Speaking of longer Rose names, Rosemary might be one of the most promising of the bunch. It’s a spice name like Saffron, and a three-syllable, ends-with-y choice like Dorothy. While some smooshes of classic names, like Marianne or Annabeth, feel like combinations, Rosemary feels like something distinctive and different. Read more about Rosemary here. We love Lucy and Ruby, Cooper and Jude. That same ‘oo’ sound gives us Ruth, a Biblical favorite from the decade. It’s gained steadily in use over the last five years, and is poised to continue to rise. While Ruth sounds intelligent and strong-willed, nickname Ruthie is all kinds of darling. Take the chart-topping, wildly popular Sophia, add the equally compelling middle ‘v’ sound, and you have Sylvia. 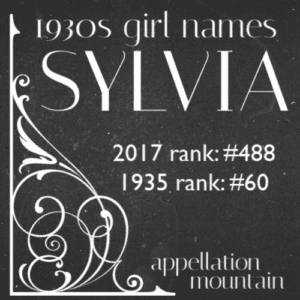 An ancient name with a woodsy meaning – it comes from silva, forest – Sylvia peaked a little later than Sophia, which might explain why it’s only beginning to rise now. My tastes normally run into the more unusual side of names, ones that are far from popular and some that may even be a bit surprising (though not overboard or yooneek). Generally if a name is too familiar or popular I get bored of the sound of them and they lose all luster to me. However, no matter how many times I hear Eleanor and Sylvia, I still ADORE them. I don’t know what it is about them, but they just have this timeless, elegant but spunky quality to them that just gets me. I think they would make lovely sisters names. I also love Rose and June. 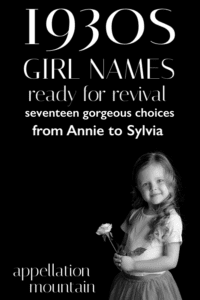 If we have another girl, our top names are Annette (nicknamed Annie) or Florence. Also love Sylvie (not Sylvia as much). These are great names. I’d love to meet a little Bonnie also. Oh, I love so many of these! I guess the 1930s is my style. 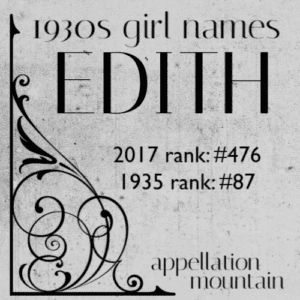 Edith is one of my favorite names with Dorothy nn Dottie and Rose close behind. I adore Virginia too. She seems to fit in with 1930s names. So many of these are just darling! An acquaintance of mine has a 2 yo Edith called ‘Edie’, and it’s just the sweetest on a little girl! 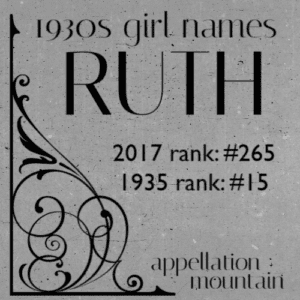 My daughters are Ann “Annie” and Ruth “Ruthie” so I guess I liked the 1930’s names! 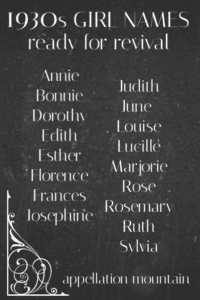 I’ve met quite a few little girls lately with their names and Frances, Josephine, Edith and Louise. These are definitely becoming popular where I live. I love so many names on this list. 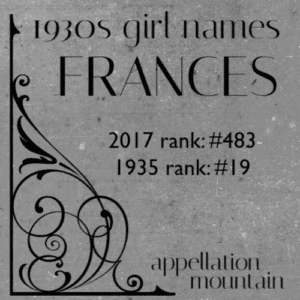 Our eldest was almost Frances, nn Francie. And our youngest was almost Edie or June. I still mourn those names a bit. I have also loved Bonnie for ages but could never get my husband on board. Esther is gorgeous, too and I totally dig Marjorie. Wanted to use Rosemary, nn Romy, to honor some relatives but #3 ended up being a boy. And by the time we had our fourth we had adopted a dog that came with the name Romy. Seemed like kismet to me! I adore Rose and Rosemary! Like Bonnie, Judith and Ruth too.